figure 9.68 Compressed Lepidocarpon cone (Pennsylvanian). Bar = 1 cm. figure 9.69 Longitudinal section of Lepidocarpon sporangium (below) and transverse section (above). Arrows indicate lateral laminae (Pennsylvanian). Bar = 5 mm. 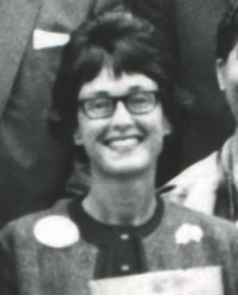 figure 9.71 Margaret K. Balbach. tissues are present. When only the lepidostroboid sporo-phyll is preserved in the compressed state, the generic name Lepidostrobophyllum is sometimes used (FIGS 9.72, 9.73). Embryos have also been found in the cone Bothrodendrostrobus (FIG. 9.74) (Stubblefield and Rothwell, 1981). In the earliest stage of development, the embryo consists of an unvascularized globular structure embedded within megagametophyte tissue. In more mature specimens, two vascularized appendages extend through the trilete suture, one representing the first shoot, the other the first root. It was initially suggested that embryology in Lepidocarpon and Bothrodendrostrobus was sufficiently different to demonstrate two evolutionary paths within the lycopsids (Stubblefield and Rothwell, 1981). What was originally interpreted as bipolar development in Bothrodendrostrobus is now considered to be a derived condition of the unipolar developmental pattern demonstrated in Lepidocarpon (Rothwell and Erwin, 1985). figure 9.72 Detail of Lepidostrobophyllum showing sporangium attachment scar (arrow) (Pennsylvanian). Bar = 1 cm. 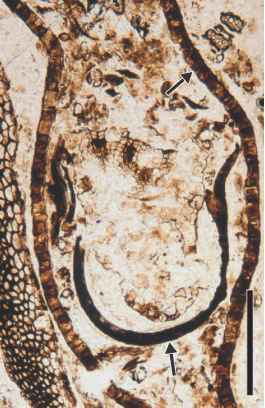 figure 9.73 Compressed Lepidostrobophyllum showing the point of sporangium attachment (arrow) (Pennsylvanian). Bar = 1 cm. distal, winglike attachment to the large functional spore. This extension may have been involved somehow in dispersal, or it may have functioned to orient the apical prominence of the trilete suture so as to enhance the possibility of fertilization. 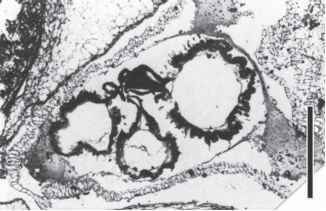 figure 9.76 Aborted megaspore of Achlamydocarpon varius with proximal massa (arrow) (Pennsylvanian). Bar = 250 pm. smaller abortive spores, each with a massa near the proximal suture. 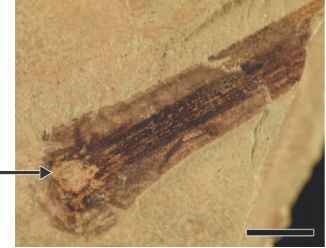 Based on the organization of A. pingquanensis , it is suggested that this disseminule adds additional support to the idea that there is a group of arborescent lepidoden-drids from China that is distinct from those in Euramerican Carboniferous deposits. 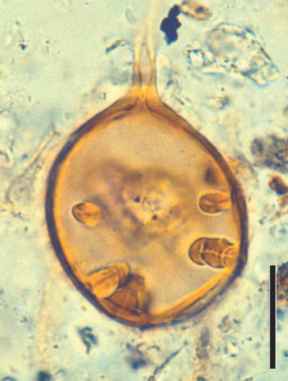 A single large megaspore within each sporangium is also a feature of the cone Suavitas imbricata collected from Upper Pennsylvanian marine deposits of Texas, USA (Rice et al., 1996). 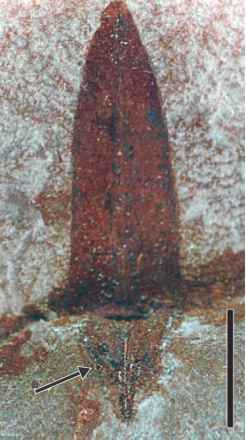 The cone is permineralized and the sporangium is located at the distal end of the sporophyll. 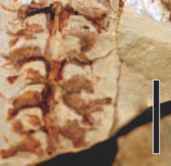 Although the affinities remain conjectural, the analysis of characters suggests some relationship with the rhizomorphic lycopsids. Achlamydocarpon is believed to represent the cone of several different species of Diaphorodendron (DiMichele, 1981, 1985), based on an analysis of several hundred permineralized specimens of Diaphorodendron from Lower and Middle Pennsylvanian rocks. DiMichele recognizes different morphological groups among the Euramerican forms of lep-idodendrids, each distinct relative to reproduction, habitat, and evolutionary history. 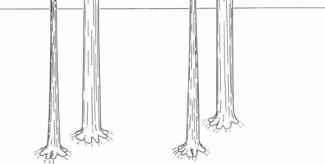 One group, consisting of D. vasculare, D. scleroticum, and D. phillipsii, included trees 8-20 m tall (FIG. 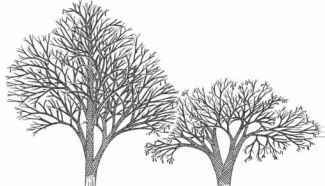 9.77) that had deciduous lateral branches bearing cones of the A. varius type. Synchysidendron trees were smaller (from 10 to 15 m tall) and produced A. varius cones, but these occurred in large numbers near branch tips toward the end of the growing season. DiMichele (1981) suggested that the coal-swamp environments may have acted as evolutionary refugia for some of the arborescent lycopsids, such as Diaphorodendron and Lepidophloios, a habitat preference no doubt dictated by their reproductive biology, which was well adapted for aquatic dispersal. DiMichele (1980) also speculated that speciation in this group may have taken place outside the swamp habitat. inner separable layer, which may be involved in regulating water balance. 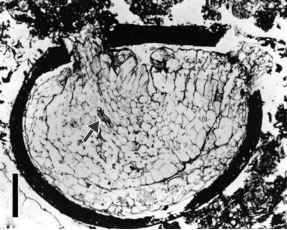 It is also important to characterize megaspore wall development at the ultrastructural level for its systematic value (Hemsley and Scott, 1989; Hemsley and Galtier, 1991). This type of study is useful in identifying the parent plants of dispersed spores, and the floral composition of particular assemblages where megafossils are absent or poorly preserved. 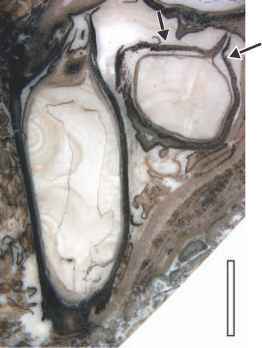 Ultrastructural studies also provide important information about the development and evolution of lycopsid spore walls (Glasspool et al., 2000). figure 9.78 Detail of sporopollenin units forming the wall of a functional Lepidocarpon megaspore (Pennsylvanian). Bar = 3 pm. 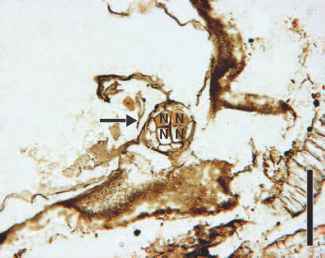 figure 9.79 Polar view of Flemingites schopfii arche-gonium (arrow) showing four neck cells (N) (Pennsylvanian). Bar = 100 pm. wall. 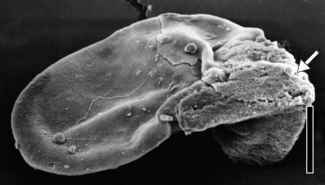 Other megagametophytes possessed archegonia at the time of fossilization, and several archegonial necks have been described interspersed among the rhizoids. Archegonia have from one to three tiers of neck cells (FIG. 9.82) and, in a few specimens, an enlarged cell, suggestive of an archegonial venter, occurs beneath the neck cells. 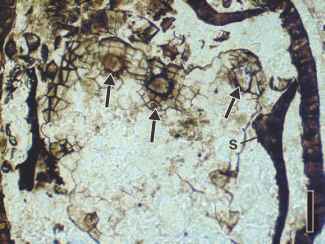 Some microspores in the distal sporangia in F. schopfii reveal stages in the development of the microgametophyte, including partitions suggestive of the antheridial initial and prothallial cells. Some contain material that morphologically resembles chromosomes (Brack-Hanes and Vaughn, 1978) (FIG. 1.25) . When compared with the gametophytes of existing lycopsids, F. schopfii has microgametophytes that are more similar to those of extant Selaginella, whereas the structure of the megagametophytes more closely corresponds to that of Isoetes. Other well-preserved lepidodendrid megagametophytes (FIGS. 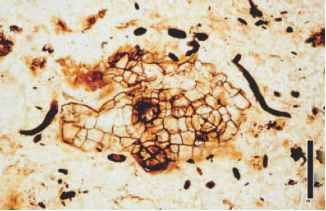 9.80-9.82) have been discovered in spores assignable to Lepidodendron esnostense or L. rhodumnense that occur in late Visean (uppermost Mississippian) cherts from central France (Galtier, 1964b ) 1970a, b); these occur in dispersed spores as well as in specimens still within the megasporan-gium (FIG. 9.81) . The megagametophytes are multicellular structures that develop inside the megaspore wall (endosporic gametophyte development). 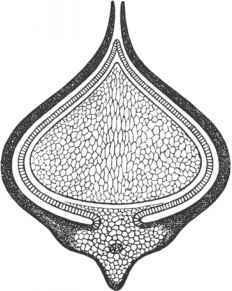 As they mature, however, they protrude from the spore in the region of the trilete suture, where they form a mass of tissue, within which several arche-gonia are produced (FIG. 9.82); rhizoids appear to be lacking. 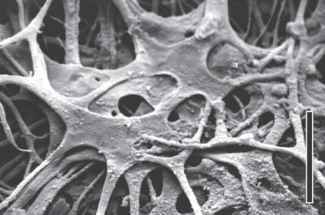 Archegonia are embedded in gametophytic tissue, with only the uppermost ring of neck canal cells protruding from the surface. The microgametophyte of this taxon remains unknown to date.